YES! 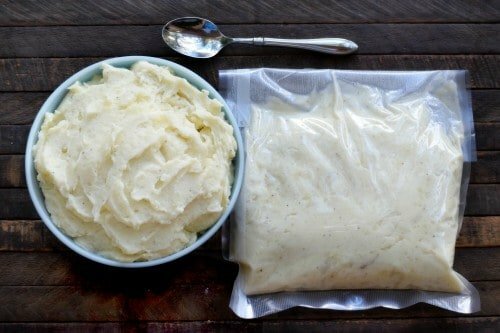 You can make mashed potatoes ahead of time and freeze them. This recipe freezes beautifully and reheats in the microwave or oven! Hey friends! Today I’m sharing a little bonus recipe with you to compliment my Freezer Shepherd’s Pie. 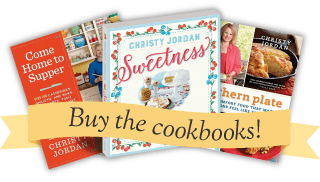 Both are great make ahead recipes that I seal in FoodSaver bags and store in my freezer for those crazy nights when the temptation of a drive through supper has it’s strongest lure. Instead of caving and grabbing a pizza or bag of burgers, I go grab a couple of bags from my freezer, do a quick thaw, and have one of my family’s favorite suppers ready with just a matter of popping it in the oven. This recipe is also a great low fuss side since it is made ahead, perfect to stretch out Sunday dinner or serve alongside a quick little weeknight supper. 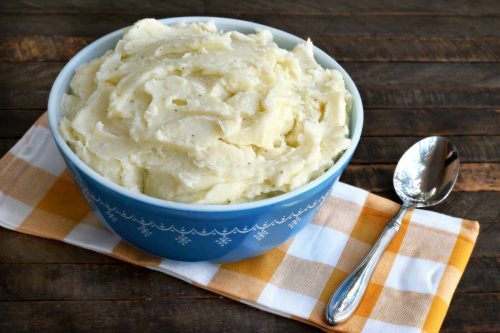 If you’ve been looking for a mashed potato recipe that freezes well, I hope you print this one off to try soon! Note: This recipe makes two family sized servings. Peel and cube the potatoes. Place in large pot and cover with water. Put pot over medium high heat and bring just a boil. Reduce heat to medium and cook until potatoes are tender. Drain well. Place potatoes back in pot and add butter and cream cheese. Mix up with potatoe masher until fluffy. Stir in salt and pepper to taste. Serve half immediately and place the remaining half in a FoodSaver bag and freeze. To serve the frozen potatoes, thaw in the refrigerator over night. Snip one corner of the bag off to vent and microwave 4-5 minutes, or until heated through. Stir well before serving. If you don’t have a FoodSaver vacuum sealer yet, I highly recommend them as appliances that can save you hundreds of dollars on your grocery bill each year. I can’t tell you how many times I’ve bought up meat and stored it in freezer zipper seal bags only to find it freezer burned and covered in ice crystals later. Vacuum sealing it keeps my meat fresh for years – YEARS. Literally. Check out more information by visiting some of my other FoodSaver posts below. Note: This post was not sponsored by FoodSaver but some of my posts about FoodSaver were. I genuinely love the appliance and use it often so it is natural that I talk about it from time to time. Will the mashed potatoes freeze properly without the cream cheese? I have a vacuum sealer, but I do not like cream cheese in mashed potatoes! Thanks. The cream cheese helps keep them from being watery and holds them together better through freezing and thawing. If you leave that out you might want to add in some sour cream, more butter, etc. I have the same question as Evelyn about the cream cheese. Also, do you mix the potatoes with an electric mixer or just use a potato masher? Thanks to your recommendations when I found a Food Saver Vacuum Sealer in a thrift store along with a roll of bag material for $12 I snapped it up. I love, love, love it. I live alone and now am able to buy family pack meat specials and split it into individual packs for the freezer. Oh cool! I didn’t know this about cream cheese and potatoes! Thanks, Christy! Thanks my daughter hates box or store brought mash potatoes and me and I know potatoes don’t freeze well, but I will try this how long can they be frozen? I agree about the food saver. My husband saw one on QVC and insisted we needed one. I think he uses it more than I do! Can’t wait to try these potatoes. I have used the same recipe for crock-pot mashed potatoes, but these will be perfect for the holidays. I haven’t tried it but would love to hear how it turns out if you give it a try!! What type of potatos do you use? Hi! I am a newbie to home cooking. Could I use milk and/or heavy cream in place of the cream cheese with the same results? Thanks! Hey! I normally use milk and/or heavy cream when making mashed potatoes and they turn out wonderfully! However, when you freeze them, the milk tends to separate (cream, too) whereas cheese helps it all hold together better and keep it’s original texture rather than becoming a bit mealy.